Retinoblastoma can spread beyond the eye when it is not diagnosed promptly and treated appropriately by an experienced doctor. This is called extraocular or metastatic retinoblastoma. Delaying recommended eye removal surgery puts the child’s life at serious risk, and is the second most common cause of extraocular retinoblastoma and death after delayed diagnosis. There are three ways retinoblastoma can spread outside the eye. Along the optic nerve to the brain, cerebrospinal fluid (fluid bathing the brain and spine) and meninges (the lining of the brain). Through blood vessels in the choroid and sclera (outer layers of the eye) to the eye socket, bone marrow or lymph nodes in the neck. Via a network of veins that drain fluid from the front of the eye into the bloodstream. biopsy without complete removal of the eye. 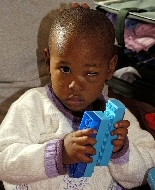 Extraocular Retinoblastoma has spread anywhere outside the eye, e.g. the orbital tissues, lymph nodes, optic nerve, and beyond. Metastatic Retinoblastoma has spread to distant sites beyond the eye e.g. the brain, bone marrow or other parts of the body. By its nature, all metastatic retinoblastoma is extraocular, but not all extraocular retinoblastoma is metastatic. Tumour spread beyond the eye is very common in resource-limited regions of the world, where diagnosis is often delayed, and treatment Is difficult. Though rare in developed countries, extraocular relapse has become more common in recent years due to increased efforts to save severely affected eyes.